Amenities: Gas central heating. Electric oven and hob, microwave, fridge/freezer, washing machine, dishwasher, TV with FreeSat, DVD, WiFi, selection of games. Bed linen and towels inc. in rent. Fuel and power inc. in rent. Off road parking for 2 cars. Raised terrace with lawned areas, furniture, summerhouse and mooring onto River Thames. Sorry, no pets and no smoking. Shop and pub 3 mins walk. Note: Children over 10 years old only. Note: The raised terrace is open and without balustrade and there are 8 steps down from the terrace to the garden. Note: The mooring is accessed via 4 steps from the garden and is unfenced. Note: The River Thames is deep and can be fast flowing. Note: Due to the raised terrace and river, children must be supervised at all times when outside. Note: No hen/stag or similar. Town: Wallingford has a history dating back to King Alfred and it was at Wallingford that William the Conqueror crossed the Thames with his army, before marching on London. Wallingford Castle was built at his command to cement it's royal importance, and during its lifetime has played host to many royal visitors including King John, Henry Vl and Edward the Black Prince, to name but a few. Unfortunately, what remains of it now is only impressive earth works but some of the stones were re-used to build the St Mary-le-More Church which can be found near the centre of the town. All ground floor. Four bedrooms: 1 x king-size double, 1 x double, 1 x twin, 1 x single with pull-out stacker bed. Bathroom with bath, walk-in shower, basin and WC. Bathroom with bath, basin and WC. Basin and WC. Kitchen. Utility. Dining room. Sitting room. Study. Gas central heating. Electric oven and hob, microwave, fridge/freezer, washing machine, dishwasher, TV with FreeSat, DVD, WiFi, selection of games. Bed linen and towels inc. in rent. Fuel and power inc. in rent. Off road parking for 2 cars. 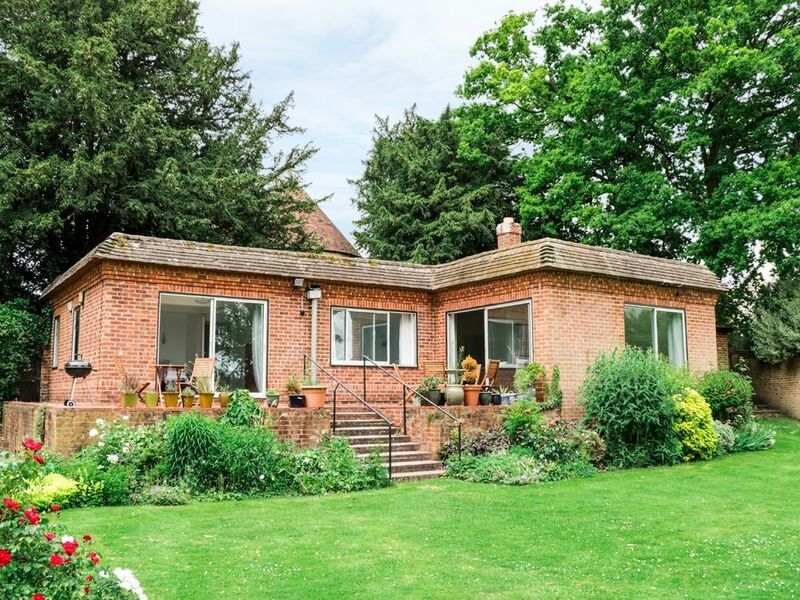 Raised terrace with lawned areas, furniture, summerhouse and mooring onto River Thames. Sorry, no pets and no smoking. Shop and pub 3 mins walk. Note: Children over 10 years old only. Note: The raised terrace is open and without balustrade and there are 8 steps down from the terrace to the garden. Note: The mooring is accessed via 4 steps from the garden and is unfenced. Note: The River Thames is deep and can be fast flowing. Note: Due to the raised terrace and river, children must be supervised at all times when outside. Note: No hen/stag or similar. Best feature is the garden leading to the river, perfect for summer drinks. House is well equipped, not pretty or loaded with features but works well. Easy walk into town, pubs etc and Waitrose.